HuntMode posted an article about “Worried re Your First Turkey Ever?“ made me think it’s time to cook turkey and there is a turkey in my freezer. A turkey sat in the freezer with a due date Jan 2, 2013. Brand name: “Butterball”. That is almost a year! I need a wing and prayer how to cook a turkey. Never cooked a turkey before and ambition took a hold of me to learn how to cook one item a year. Turkey it is. My family loves to cook turkey all year round. One look at turkey makes me gag and the only thing that I eat from a fresh-baked turkey is the Pope’s nose. My fondness for turkey is the carcass only to make turkey soup. Back to frozen turkey. Butterball is a good brand, so they say. As it turned out, this company has a 1-800 talk-line for people having turkey trouble. Being a turkey that I am, I did not call the help line instead sent them an e-mail message asking whether it’s safe to cook a turkey pass due date. And I did receive a response! Thank you for contacting the Butterball Turkey Talk-Line! Solidly frozen Butterball turkeys do not spoil in the freezer. However, eating quality will diminish over time. For maximum eating quality we recommend using frozen Butterball® turkeys, which have been stored in home freezers at zero degrees F or below in original wrapper, within six to seven months. Butterball turkeys held up to two years in home freezers from date of processing are still of good quality and safe to eat. After two years home freezer storage eating quality will likely be less, not a safety problem. Suggest using the cooked turkey meat for making casseroles or soup. Also, while stored in the freezer, any tears in the plastic wrapper will expose the turkey to air and lead to freezer burn (light-colored and dry-looking areas on the surface) and accelerate flavor deterioration. Although safe to eat, these exposed areas may be dry or tough after roasting. 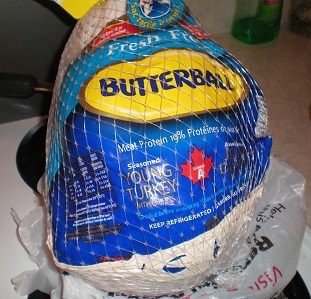 So folks, if you want to talk turkey, contact turkeytalkline@butterball.com. As much as I would like to join the Turkey Club in my family, this is not my calling. The question is when will I cook the turkey? You can find the answer here. December 26 is the time when my family cooks the carcass of the turkey to make soup. Everybody, I mean every body, looks forward to this famous soup. Luckily, no turkey for me on Christmas dinners due to a self-imposed quarantine, sick as a dog with colds. Unfortunately, I will miss out on the turkey soup. Boo hoo.